The Devil was once the most favored of the host of angels serving the Lord. But pride welled in his breast. He thought it unseemly for him to serve. The Devil and his band of followers, who likewise suffered the sin of pride, were defeated in battle by the Lord and his host...and were banished to the outermost depths of Hell, never to know the presence of the Lord or look on Heaven again. Smarting with his wounds but all the more swollen with pride, the Devil cried out from the depths, "It is better to rule in Hell than serve in Heaven." The Devil proclaimed what was once lost in Heaven would be gained on earth. He said, "My offspring, the gargoyles, will one day rule the Lord's works, earth and man." And so it came to pass that while man ruled on earth, the gargoyles waited, lurking...hidden from the light. Reborn every 600 years in man's reckoning of time, the gargoyles joined battle against man to gain dominion over the earth. In each coming, the gargoyles were nearly destroyed by men who flourished in greater numbers. Now it has been so many hundreds of years that it seems the ancient statues and paintings of gargoyles are just products of man's imagination. In this year, with man's thoughts turned toward the many ills he has brought upon himself, man has forgotten his most ancient adversary: the gargoyles. With such a rich subject, it is surprising that more filmmakers hadn't taken advantage of it by the time director Bill L. Norton's Gargoyles aired on November 21, 1972. Perhaps when a movie is as good as Gargoyles, there's no need to look any further. Dr. Mercer Boley (Cornel Wilde), an anthropologist, is doing research for his new book, Five Thousand Years of Demonology. It will trace man's conception of evil from 3,000 BC to the present. Joined by his daughter Diana (Jennifer Salt), the two stop by Uncle Willie's Desert Museum on their way to Mexico. Willie (Woody Chambliss) has told Dr. Boley that he has a few Indian artifacts and transcripts of authentic exorcism rites that might be of interest to him. Instead, the old man takes his guests to a shack where he shows them something else...an odd skeleton he assembled from a skull and bones he found in the canyon. It looks like a combination of both animal and human bones. Dr. Boley thinks it must be some kind of trick. But Willie is serious. He tells the doctor and Diana that the Indians used to have a camp in the area for hundreds of years - and told stories about "devils" who lived up in the rocks. Willie would like to write a book with Dr. Boley and split the profits. Dr. Boley is curious to hear more. Willie locks the door to the shack because the sun is going down, while Diana sets up a tape recorder. As Willie talks about the gargoyle legend, there is a commotion. A clawed hand tears the roof and as Willie tries to save the skeleton, part of the roof caves in. A kerosene lamp is knocked over and Willie and the shack are set on fire. Dr. Boley grabs the gargoyle skull and both he and Diana run to their car. As they quickly drive away, they listen to the recording of Uncle Willie's testimonial. Just then, a creature leaps on top of the station wagon and causes it to swerve off the road. Managing to escape, the two drive up to a gas station to have the vehicle repaired by the attendant, Buddy (Jim Connell). They then check into the Cactus Motel next door, which is run by Mrs. Parks (Grayson Hall). The next morning, Dr. Boley and Diana report the death of Uncle Willie to the authorities. The police chief (William Stevens) and Officer Jesse (John Gruber) accompany them to the old man's property. When they arrive, the cops find a group of bikers rummaging through the wreckage. The officers assume that the dirt riders started the fire. After a chase, the men are caught and booked...despite a protest of innocence from James Reeger (Scott Glenn) and his friends. That evening, as Dr. Boley and Diana lay in bed at the motel, two gargoyles enter the room and steal the skull. As they try to get away, one of them is hit by an oncoming truck and killed. Mr. Boley takes the creature back inside to study it. The commotion frightens Mrs. Parks, who complains about the noise. Diana stops by the police precinct to speak to the chief but he isn't around. She wants to get the bikers off the hook - but even James doesn't believe her gargoyle story. After arriving back at the motel from the precinct, Diana and her father are attacked by several creatures looking to retrieve the body of one of their own. Diana is abducted and Dr. Boley's car is overturned. Mrs. Parks reports the attack to the police chief and Dr. Boley confirms her account. Needing additional help, the chief agrees to free the bikers so they can join them on the search for Diana. Mrs. Parks and Buddy take off in Buddy's pick-up to get state help. Buddy's truck is later discovered, abandoned and with the front seat covered in blood. Mrs. Parks is found hanging upside down from a pole. With the exception of James and Ray (Timothy Burns), this is enough to scare away most of the dirt bikers. The gargoyles have taken Diana back to their lair up in a cave. The leader (played by Bernie Casey) takes a personal interest in her. Several of Dr. Boley's books were stolen and the leader wants Diana to read to him. Knowledge is important and he tells her, "We've only been alive for a few weeks. We must not let you kill us off...not this time." Hundreds of eggs are starting to hatch and as Dr. Boley and the police approach the cave, the adult gargoyles strike. Ray is clawed to death. Dr. Boley shoots several of the creatures and the leader brings the doctor back to the cave, promising him Diana. But it's a lie. Dr. Boley is told that it has taken the gargoyles five hundred years to be reborn and they intend to take over the world. The doctor escapes and with the help of James, they set the cave on fire. The head gargoyle takes flight with his injured female companion...ready to fight a battle another day. The cast in Gargoyles is uniformly good, including Scott Glenn in an early role...and former pro football player Bernie Casey, unrecognizable as the imposing leader of the pack. Dark Shadows veteran Grayson Hall is amusing as Mrs. Parks, an alcoholic beverage always in hand. Jennifer Salt starred the following year in Brian de Palma's Sisters and she would later land a role in the groundbreaking sitcom, Soap. Cornel Wilde, whose career in film went back as far as 1936, died in 1989 of leukemia. Director Bill L. Norton continues to work in television. 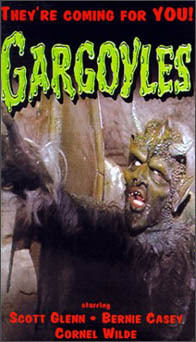 Gargoyles is truly one of the most memorable Made-for-TV fear flicks, with beautiful, rustic New Mexico locations (it was filmed in the Carlsbad Caverns area) and stunning Emmy-winning make-up by future three time Academy Award winner Stan Winston (Aliens, Jurassic Park, Terminator 2). Watch it with the lights out....if you dare.